This morning I sat on a talk about “A Business Perspective on Deploying ArcGIS Server in the CLoud”. Esri likes to define 3 areas that ArcGIS Server can run; on premise, hybrid an cloud. 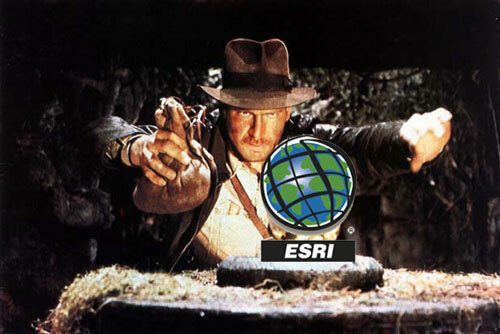 You can see how ArcGIS Server fits in with each environment. The talk was actually pretty good on the reasons why a hosted environment makes more sense than rolling your own equipment. I’ve had issues with how Esri defines ArcGIS into the cloud, but this talk was somewhat refreshing and realistic. A very nice change. The freedom that a virtual environment gives you for growing your business can’t be overlooked, something I’ve learned here at WeoGeo. But this same business case can be applied to those rolling out ArcGIS Server. At 10.1, AWS AMIs will include Ubuntu Linux, PostGIS and of course Windows choices. I’m happy to see a Linux AMI choice, but unfortunately the news is that I still can’t roll out 10.1 linux myself, I have to use Esri’s AMI (WeoGeo creates our own AMIs for various reasons, we’d rather not run someone else’s AMI). There was a good discussion of how to figure out the cost of AWS. That’s always a bit tricky, especially when you start working with AWS. Stay on top of your instances by looking at the AWS Management Console. Or better yet, work with a SaaS provider (like lets say, WeoGeo who abstracts out all this and charges you a set amount every month. There was another section on using Vblock. I was unaware there was an Esri whitepaper on using ArcGIS with Vblock so I’m going to share it with you in case you wish to learn more about these two tools. Those who are unable to leverage Amazon and AWS should look at Vblock. I think the new features of ArcGIS 10.1 will finally see a large uptake of ArcGIS Server in AWS and other cloud providers. This summer could be interesting with the big release of ArcGIS Server in virtual environment.